Newly conserved ‘Rhinestone Cowboy house’ on view at John Michael Kohler Arts Center - Hwatien Enterprise CO.,LTD. Following more than a year of conservation work, Loy Bowlin’s “Beautiful Holy Jewel Home” is on view as part of the John Michael Kohler Arts Center’s yearlong exhibition series dedicated to the work of artist-environment builders. The Making of a Dream: Loy Bowlin + Jennifer Joy Jameson features Bowlin’s highly embellished home installed in the gallery along with a selection of his personal property and original research and oral histories from those who knew Bowlin. It will remain on view through January 5, 2019. Bowlin (1909–1995), who lived a hardscrabble life in Mississippi, was drawn out of two decades of depression by Glen Campbell’s 1975 hit record “Rhinestone Cowboy.” The song inspired him to adopt the rhinestone cowboy persona. He added rhinestones to his clothes, decorated his 1967 Cadillac, and created a home environment to serve as the backdrop for his showmanship. He adorned much of the exterior of his small home and nearly every inch of the interior. The walls were covered with patterns of cutout paper, paint, glitter, and collaged photographs and magazine illustrations. 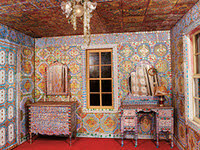 After Bowlin’s death in 1995 when The Beautiful Holy Jewel Home was slated to be razed, a Houston artist and collector purchased the home with the stipulation that it be removed from the property. In 1998, Kohler Foundation, Inc. acquired the disassembled house and later gifted the home and many of the Bowlin’s belongings to the John Michael Kohler Arts Center. In her response to this art environment, folklorist Jennifer Joy Jameson focuses on Bowlin’s impact within the McComb region. A collaborative ethno-history created from recorded oral accounts and memories of those in the area is accompanied by a photo series. The Making of a Dream: Loy Bowlin + Jennifer Joy Jameson is one of 15 exhibitions on view throughout 2017 as partㄑ of the John Michael Kohler Arts Center’s 50th-anniversary series, The Road Less Traveled. Fifteen thought leaders were invited to lend their expertise and provide new insight into the Arts Center’s renowned collection of works created by art-environment builders. Visit jmkac.org/roadlesstraveled for a complete listing of the year’s exhibition schedule. Admission to the John Michael Kohler Arts Center is free. The Road Less Traveled is supported in part by a grant from the Wisconsin Arts Board with funds from the State of Wisconsin, the Wisconsin Department of Tourism, and the National Endowment for the Arts. Funding was also provided by the Institute of Museum and Library Services, and Kohler Trust for the Arts and Education. The John Michael Kohler Arts Center is a 501(c)(3) (nonprofit) organization; donations are tax deductible.